The Boone Central girls basketball team took another step last week, walloping O’Neill in Albion Friday and racing past Wayne Saturday for a Mid-State Conference road victory. Boone Central, 9-2, got its weekend off to a great start with a dominating performance against the visiting O’Neill Eagles. The Cardinals zipped to a 20-10 first-quarter lead, then outscored the visitors by 11 points in the second period and 13 points in the third. There was no slowing down for Boone Central Saturday. 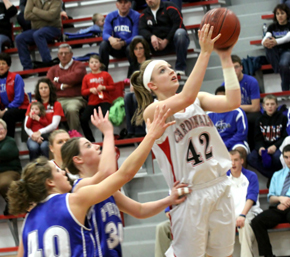 In a fast-paced contest, the Lady Cards finished both halves in strong fashion and thumped host Wayne 59-37. BC used a 15-5 blitz in the second period to open a 29-17 halftime lead. The Cards dominated the paint in the quarter with Lehmann pouring in 11 points. Wayne played the Cardinals evenly for the opening eight minutes of the second half before BC put together an 18-8 run to finish the game. Beckwith tallied five points to pace the closing stretch. Further Details & Stats in Print & Online Editions of Albion News.